Do you like avocados? she asked me. Yes, I replied with enthusiasm. She led me out the door and to the backyard of the house she and her roommate rented. 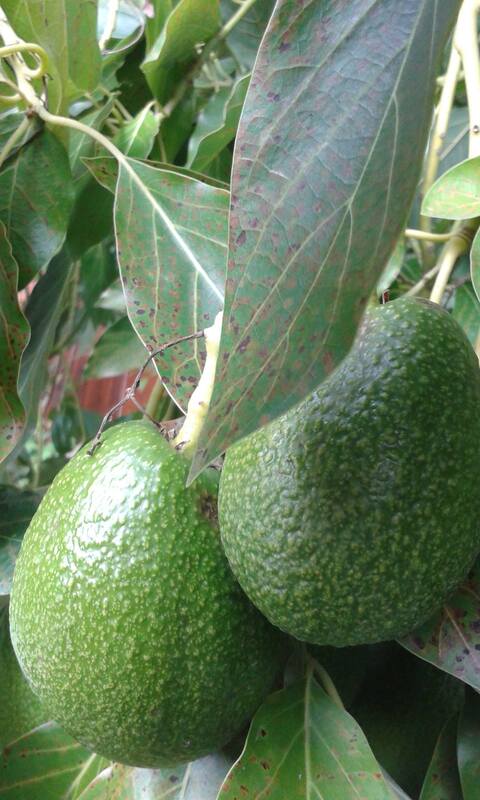 As I walked onto the porch, I saw avocados growing on a tree! 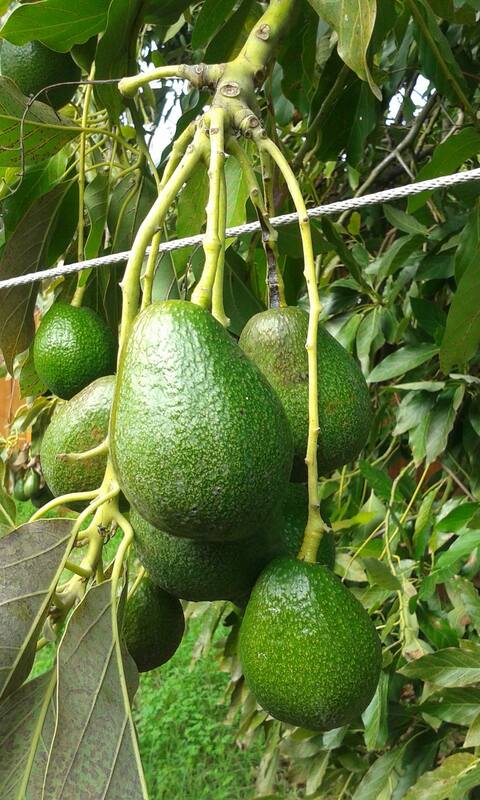 Sure, I knew avocados grow on trees, but I’d never seen it. Seeing is believing, and wow, this was amazing! 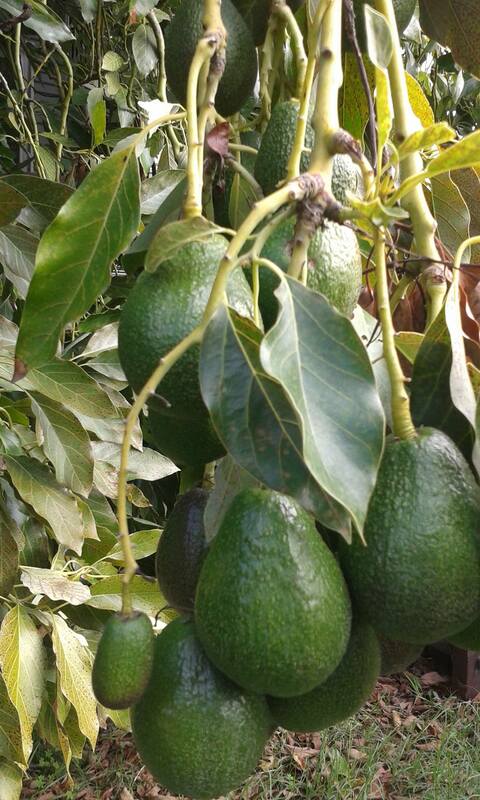 The avocado (Persea americana) is a tree that is native to South Central Mexico, classified as a member of the flowering plant family Lauraceae.Avocado (also alligator pear) also refers to the tree’s fruit, which is botanically a large berry containing a single seed. The tree in the backyard was huge. It was taller than the house and had many branches reaching toward the sky. As I looked up, up, up through the branches and shiny green leaves, I saw a multitude of fruit. Is this all one tree? I asked in awe. She assured me it was. I want to hug the tree! I exclaimed. I climbed down the steps of the porch so I could meet the tree and embrace it. I love you! I love you! I told the tree. 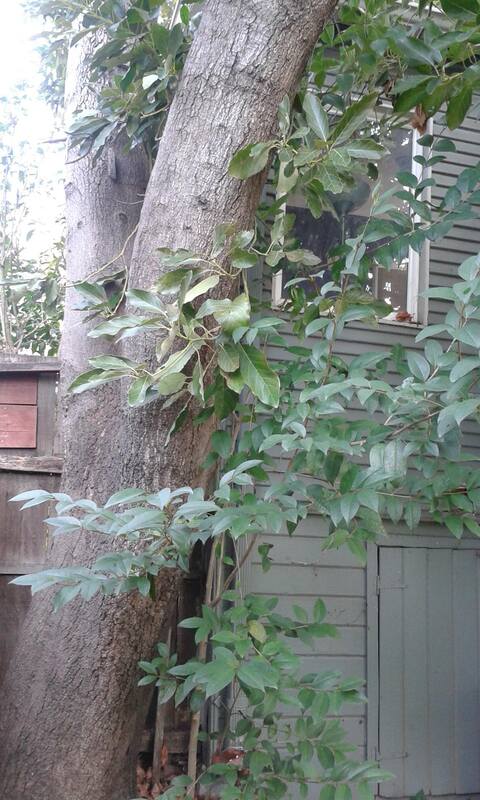 This photo I took of the bountiful avocado tree does not adequately show its great height or multiple branches. The tree is huge and the fruit plentiful. She moved into the house last year. The avocados were ripe in May. They fell from the tree and she only had to collect them from the yard. She ate all she could, gave away so many to friends and neighbors and coworkers, let the squirrels have their fill, and still there were avocados. She’s worried about the avocados this year. It’s November now, and they’re still hanging from the tree. While the fruit is plentiful, she doesn’t know if they will ever be ripe enough for eating. She fears all the beautiful fruit will shrivel on the tree and go to waste. She’s not sure what the problem is. Maybe the summer wasn’t warm enough or maybe the California drought is taking its toll. In any case, it’s going to be a shame if most of the avocados on the tree turn out to be inedible. She did eat a couple of avocados from the backyard last week. One was good, but not great. The other was quite stringy. Strings or stringy fruit or the thickening of the vascular bundles (fibers that run longitudinally through the fruit) are generally the result of fruit from younger trees or improper storage conditions. Often times the fibers or strings will disappear or become less noticeable as the fruit (and tree) matures. While I was hugging the tree and exclaiming over the abundance of fruit, she chose half a dozen avocados for me. When we went inside, she put them in a paper bag, told me keeping them in the bag together would help them ripen. Like the banana, the avocado is a climacteric fruit, which matures on the tree, but ripens off the tree…Once picked, avocados ripen in one to two weeks (depending on the cultivar) at room temperature (faster if stored with other fruits such as apples or bananas, because of the influence of ethylene gas). The avocados she gave me are currently still too firm to try to eat, but I am hopeful they will ripen and turn out to be delicious. I’m grateful to be the recipient of such a precious treat. I was recently alerted to a great article about 14 health benefits of avocados. The article includes lots of information about all the good reasons to eat avocados, as well as four recipes.